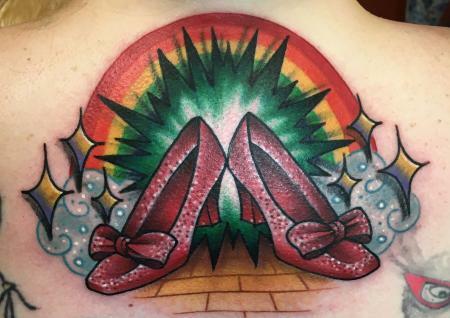 You don't need a shoe fetish to add a ruby slippers tattoo to your collection. The iconic footwear conjures up the transformative power of a life-changing challenge and an appetite for unscripted adventure. Ruby slippers are an unmistakable - and beloved - graphic image. Judy Garland first clicked her heels together in those red slippers in 1939. Since then, the phrase "There's no place like home" has invoked childhood, movie magic, courage, heart and smarts. The original powerful shoes glittered on camera with deep ruby sequins. 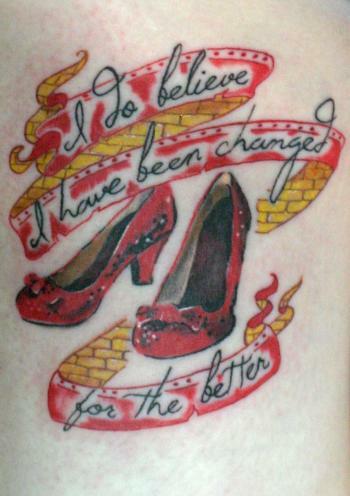 Ink ruby slippers on your skin to signify belief and bravery. The Wizard of Oz, both book and film, spans generations of childhoods. Your grandparents would recognize those slippers, and chances are your grandchildren will, too. When you don't have a pair of sparkly red slippers for your feet, put some leg into it. Ink a montage of scenes from the movie over your entire shin and calf, with the standout shoes front and center. Plucky young Dorothy's footwear carries her off, deep into a quest, more effectively than that tornado ever did. Dorothy doesn't just "come of age," she comes to her senses as she confronts every distraction from what really matters: the strength of character that comes from her own roots. The Kansas farm girl isn't just a hapless actor in a fantastical puzzle. She's a warrior. She claims her shoes from an evil despot and marches off to free an enslaved people from tyrannical oppression. Dorothy defeats two incredibly forceful, tenacious witches - an ordinary person literally squashing repression and speaking truth to power. You can harness this symbol by keeping it simple with a small pair of ruby slippers etched into the curve between your ankle and heel. Those in the know will know what that means. You never give up. You love what you love and you will go to any length to protect it. Even dark times can't dim your belief in the rainbow after the storm. That essential optimism is a guiding force that colors your life with magic and meaning. Tap your metaphoric heels together and you can make your dreams come true. Reserve a shoulder, your upper chest or the expanse of your back for a fragment of yellow brick road, an arc of rainbow, the dazzle of enchantment and a pair of gleaming ruby slippers, glittering like crushed jewels, setting off sparks as they touch. Each time you look at that ruby-rainbow ink, you get a rush of invincibility all over again. Not every tattoo delivers that much explosive energy and promise. 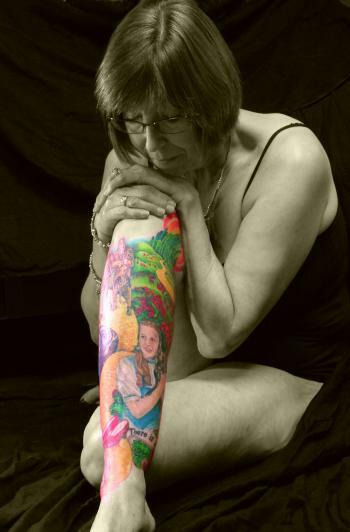 Your upper arm and shoulder area is a perfect canvas for a tat that features the ruby slippers, your affection for home, and your pride in who you are. 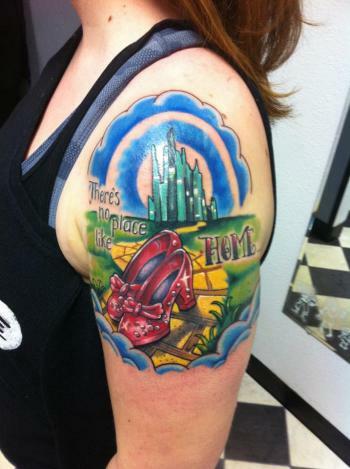 "There's no place like home" isn't just nostalgia or homesickness. It's a declaration of intent to stand firm in your own presence and integrity. The yellow brick road leads to the Emerald City, but the shoes lead you some place even richer and more fabulous. They lead you home, back to your true self, to the source of your own fearlessness. Include all of it in a scene with the iconic golden pavement, the vivid green towers of Oz, a curve of blue sky to symbolize your journey, and Dorothy's fervent incantation, the one that summons your power. From your perspective, those gorgeous slippers loom larger than life, transporting you safely through the toughest times. So place them at the front of the canvas, dominant in the tattoo, an unmistakable symbol. The wide popularity of L. Frank Baum's stories and the enduring devotion to the film have resulted in numerous works based on The Wizard of Oz. From TV shows to video games to a long-running Broadway musical, Dorothy's plight and her pretty pumps get a lot of mileage. This leads to a certain amount of crossover and you can take advantage of that to create your own ruby slippers tattoo message. "I do believe I have been changed for the better," is a line from the lyrics to the song "For Good" sung by the witches Elphaba and Glinda in the musical Wicked. Combine lyric and shiny red shoes for your own declaration of the journey and your personal power. 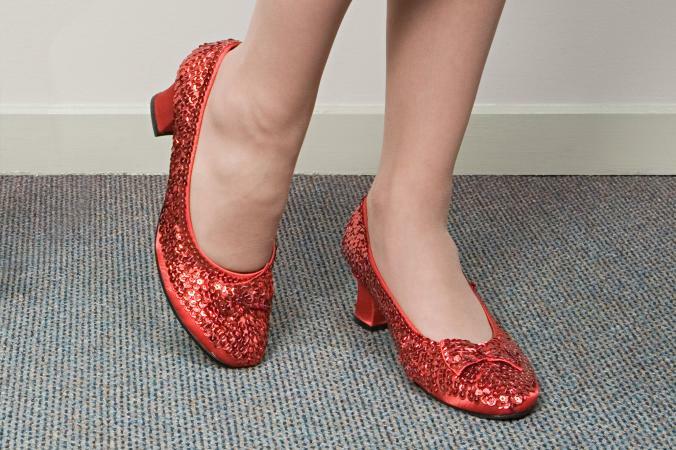 On a foot, an inner arm, the small of your back, the back of your neck, ruby slippers signify that you are self-aware and unafraid of whatever tests life brings you. 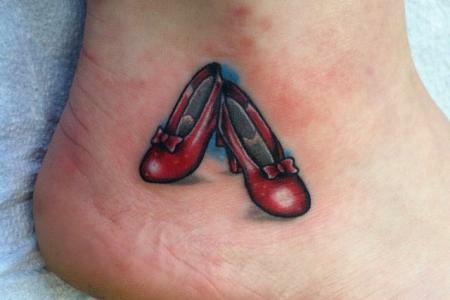 Inked Magazine and Tattoodo have a few ruby slippers tattoo images to inspire you and your tattoo artist. The National Museum of American History website has a photograph of the original shoes Judy Garland wore - perfect still life for a talented tattoo artist to copy for you. Hang onto your magic shoes. In the 1939 film, when Dorothy and her companions finally reach Oz, the Wicked Witch of the West streaks over the city, sky-writing an ominous message with her broom. "Surrender Dorothy" hangs in the air, terrifying the populace and giving the phony wizard cover to send Dorothy out to vanquish the witch. Dorothy never surrenders - and she certainly doesn't give up her spellbinding kicks. Her obstinate belief in her mission, her increasing courage when confronted with escalating peril, her refusal to yield to the easy way out are the real power symbolized by those shoes. Their image is not gendered - the ruby slippers belong to everyone who's loved the classic movie. That unmistakable icon from The Wizard of Oz is shorthand for your own indomitable spirit. Ink those shoes on, so no one can ever take them away from you.